We have received word that Phyllis J. Polman (pictured at right), 85, died Sunday, January 27, 2008 at Kosciusko Community Hospital, in Warsaw, Ind. 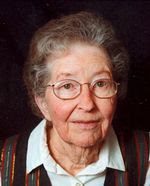 Her husband, Gerald, served as pastor in a number of Grace Brethren churches prior to his retirement. They had been married more than 63 years. Arrangements are pending at Redpath-Fruth Funeral Home.